For 2018, South Bay Pontoon Boats by Forest River Marine, a Berkshire Hathaway company, offers over eighty floorplans of pontoon boats from seventeen to thirty feet in four series. The Sport series offers ten floorplans in twenty-five and twenty-seven feet with a single engine up to...are you ready...400 horsepower or twenty-nine feet with twin engines to an incredible maximum of 800 horsepower. Mercury Racing’s 400 ROS outboard will supply this power. Performance and luxury define the Sport series and all models in the series come standard with South Bay’s 3.0+ Performance Package. This package provides a full length 25-inch center tube with integrated transom, lifting strakes on all three tubes, a “Pad” running surface, aluminum underdeck performance skin, SeaStar® hydraulic steering, a sport ski tow pylon, plus an increase in the size of the built-in fuel tank to 47 gallons. The DC in the model name refers to the Dual Console layout with a molded and raised passenger console with locking glovebox, highback chair, and a full-width tinted windshield with opening center walk-through section. All Sport models are available in dual console or the normal starboard side driver’s helm console only layout. 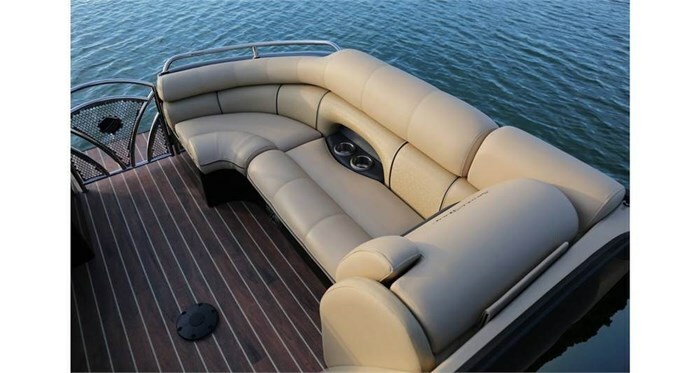 The popular RS floorplan provides twin facing bow and stern sofa lounges and with the helm and passenger consoles roughly centered in the boat. There are both centered bow and stern entry gates but the normal port side entry gate is not provided because of the windshield and passenger side console. Where almost all pontoon boat manufacturers use marine grade treated plywood as decking, South Bay uses Vixen Composites V-Lite™ honeycomb composite one-piece decking in all of its models. The Sport series offers an unusually upgraded inclusion of standard equipment. Evidence of this is not only the standard electric powered Sport Arch but also the upgraded driver’s console. This molded console is raised to provide better visibility and is fitted with a 31-inch swivel, adjustable, high back helm chair with armrests and a standard hydraulic height-adjustable pedestal. A woodgrain dash and tilt steering wheel is standard as is a 12.3-inch in-dash Murphy Digital Color-Touch screen with GPS. Also included are a speedometer, tachometer, fuel, oil, volt, trim, hourmeter, plus integrated audio. 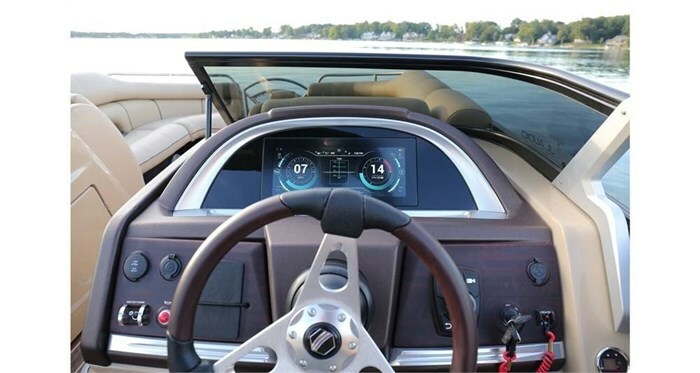 The Murphy graph radio works with a JL audio amplifier, subwoofer, four 165 Watt lighted speakers plus two exterior stern lighted speakers plus a stern-mounted remote control. All standard. Dual batteries with switch and battery charger are standard as are LED helm courtesy lights, table base, helm seat base, and floor courtesy lighting, LED exterior rail lighting, LED docking lights, and stainless steel cupholder LED lighting. More standard equipment includes a mahogany oval table, pop-up privacy curtain, extended stern platform with 4-step telescoping boarding ladder plus transom washdown. Also included are a Surlast ten foot colour coordinated bimini top and playpen cover. You get four standard colour choices of two-tone interior upholstery, eight choices of upholstery accenting colours, eight choices of flooring in Tweed, Wicker, Woven, or Teak look, eight choices of coordinated canvas colours, thirteen choices of the top panel rail skin colours plus the same colour choices to blend or contrast the panel “Sweep” striping accent, the same thirteen colour choices for the stern panels, plus nine choices of colour for the optional hull side aft accent stripe. You may also choose the optional Black Out Trim Package which gives you exactly what it says. The optional Super Sport Trim Package gives you flip-up forward bolsters on both helm and passenger chairs, Silver Sport upholstery base colour, plus Silver; helm, steering wheel, matrix vinyl floor, plus Super Sport logo plus colour-coordinated arch and rail stripe, plus two can speakers mounted on the arch. 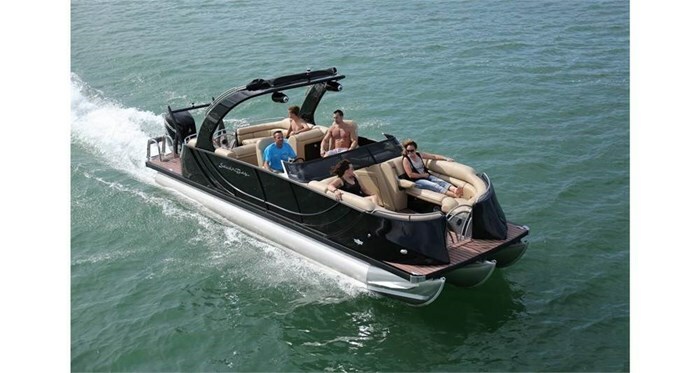 Individual options include LED underwater and/or underdeck lighting, in-floor storage compartment over six feet long, wakeboard racks, seat covers, and a rear view camera. As South bay says, “Finally a pontoon with power, style and attitude for a luxurious day on the water.” Hard to disagree.